After you install an OS in Windows VPC, you’ll notice that you can’t boot from a CD after that…the reason, the boot order is hard drive then CD. As long as your hard drive (VHD) is bootable, the VM won’t bother with your CD. It’s fairly simple to change: first you need to get into the BIOS of the VM, to do this, you need to be able to see the VM’s boot window, press SHIFT+ESC as the VM starts to unhide this, next you need to be very quick and press the DEL key to enter the BIOS, as soon as your VM starts, rapidly hit the DEL key. If you’re successful then you will be rewarded with the blue and gray BIOS screen. Go to Boot–>Boot device priority, and change the 1st boot device to CD, the BIOS will automatically swap the Hard drive to the 2nd boot device. Save your changes in the BIOS and now you will be able to boot from a CD or DVD. I have a second computer set up as a triple boot system (LinuxMint 7 x64, Utlimate Linux 2.3 x64, and Windows 7 Pro x64). After installing VBox 3 inside VBox 3 running on my main Win7 system. I thought I’d install VBox on my native LinuxMint system. I thought I’d just downloaded and installed VBox, but alas, that simple 1-step operation is still missing (at least for VBox) with Linux. It’s not difficult, but you can’t right-click your .deb file and just install with Archive Manager or GDebi. LinuxMint does provide a simple install if you want to go all the way back to version 2 of VBox. Next step: adding my Windows server shares to Linux. From vmfaq? They’ve been around since 2003? This was my first visit. Since its very similar to Ubuntu, but IMHO, superior in many ways, you can use the same “trick” to get LinuxMint 7 to boot in WinVPC. Full installs for both Ubuntu 9.10 and LinuxMint7 are in progress now. Once completed, I’ll try and get an update here and on my site. Edit: installs completed, but are not accessible. I’ll need to set aside some time to figure this out. Thanks to Matthew Guay, Ubuntu 9.10 was found to work under WinVPC http://www.flickr.com/photos/42564061@N06/4059419695/. On the first screen, choose [English]. Press [F4] and select [Safe Graphics]. Press [F6], press [Escape]. This will reveal the command line. Remove “quiet splash –“replace “vga=791 noreplace-paravirt” without the quotes. Press [Enter] to start the installation. The upcoming 3rd version of VMWare Player now allows users to create VMs, without the need for 3rd party add-ons. 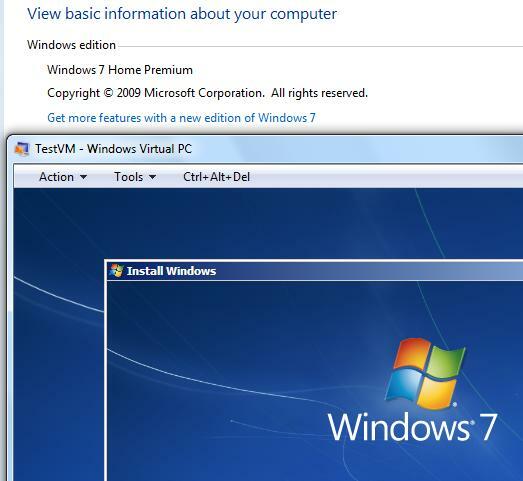 Aero support for Windows 7 and Windows Vista guests!!! Not sure about OpenGL, I tried to run a couple older 3d games that use OpenGL on my new VMWare Workstation 7 and they error out on with OpenGL issues and want a driver update. This is essentially a free version of Workstation…This is very interesting since I’d think it would significantly reduce the number of Workstation 7 sales. It’s quite easy to get the Virtual Server 2005 Linux Additions installed into OpenSuSe 10.2. These additions don’t provide much more than mouse integration and time sync with the host, but mouse integration is a big step for usability. If you tried something that works or doesn’t work, use the link to send me an email and let me know! Windows Virtual PC is not just for Pro and Ultimate! There is definitely a lot of confusion about Windows Virtual PC and what OSes support it (or it supports). Update: The information above is DIRECT from Microsoft, see the link, so the info is accurate.